Compiled by Golan Levin, May 2005. Keywords: overhead projector, OHP, transparencies, performance, interactive art, electronic art, new media art. In "An International Picture Language: The History and Aesthetics of West Coast Light Shows", Robin Oppenheimer writes: "According to Haight-Ashbury historian Charles Perry, light shows were “discovered” in 1952 by a San Francisco State College art professor named Seymour Locks who wanted to revive the European Futurist theater experiments of the twenties and thirties that used projected images on scrims with live dancers and performers. Locks experimented with Viewgraph overhead projectors, the kind used by teachers in many large classrooms. In his experiments Locks found that paints could be stirred, swirled and otherwise manipulated in a glass dish with slightly raised edges to keep the liquid from spilling." In "Wow and Flutter: A Short History of the San Francisco Tape Music Center", David Bernstein writes: "Experiments with light and sound were part of the growing interest during the late 1950s and 1960s in collaborative work breaking down disciplinary barriers. During the 1960s, light shows, an outgrowth of the “polysensorial” environments associated with the “Acid Tests,” became a major component of the psychedelic rock scene and were regularly featured at many dance and concert venues such as the Fillmore, the Matrix, and the Avalon Ballroom. Elias Romero, a painter and poet who was also one of Locks' students, learned the technique and began to present light shows at parties and other venues. Romero also collaborated with Bill Ham, another light show specialist. The two artists worked with floating colored emulsions, rotating color discs, and slide projections, all having the effect of an of a new form of kinetic art." 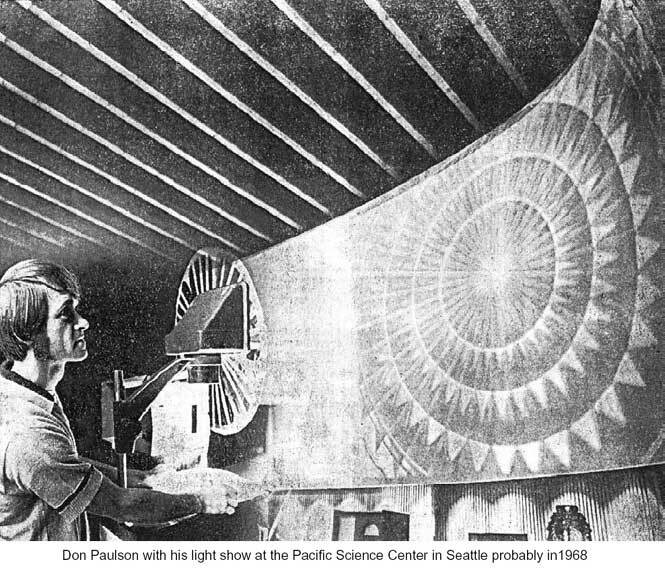 Photo: Don Paulson, an early practitioner of OHP-based kinetic light shows, in 1968. 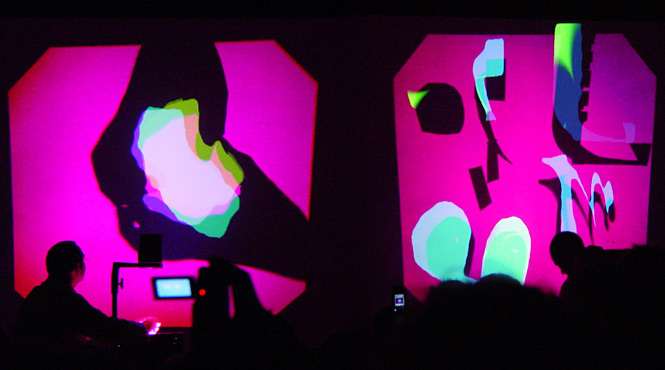 MikoMikona is a German duet exploring new forms of opto-electronic performance media. 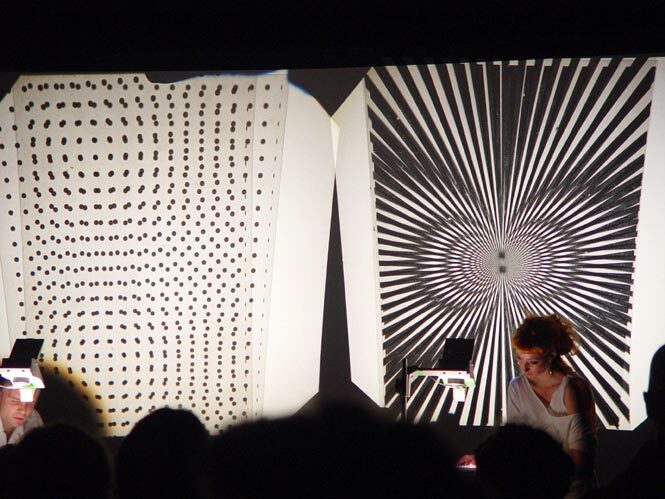 Their audiovisual performance Fourier-Tanzformation I+II is conducted on overhead projectors with transparencies, whose stripes and dot patterns are interpreted as sounds by a camera system. The transparencies are positioned by hand as well as with the assistance of small motors. The artists write: "With the piece Fourier-Tanzformation I+II Mikomikona present a physical-semiotic experiment. In this investigation, we make use of two overhead projectors as sound devices. To accomplish this we layer several transparencies with raster patterns; flickering interferences are produced through shifting of the layers. Parallel to the projection, we capture these interferences with small video cameras and transform the video signal into acoustic events. We implement our image-sound-converter, a small self-developed hardware device which eliminates the video’s sync signal. The spectators see the two projections of black & white moire patterns while simultaneously hearing the sound these patterns perform. What you see is what you hear. Fine moire lines produce high tones, wider lines result in lower tone pitches. With small motors we create visual and acoustic rhythmic structures. Mikomikona is dispensing with any digitalisation. This ensemble of analogue techniques represents an opto-electronic synthesizer with two crossed outputs: image and sound." In The Manual Input Sessions, a camera system observes the silhouettes cast by the performers' hands (and other objects) within the light of the overhead projector. These silhouettes are used as the controls and generative mechanisms for a variety of responsive graphics and synthetic sound processes. The computer graphics are superimposed onto the overhead projections by a computer-video projector so as to coincide with the original shadows. The artists write: "The Manual Input Sessions is a series of audiovisual vignettes which probe the expressive possibilities of hand gestures and finger movements. Our concert is performed on a combination of custom interactive software, analog overhead projectors and digital computer video projectors. The analog and digital projectors are aligned such that their projections overlap, resulting in an unusual quality of hybridized, dynamic light. During the performance, a computer vision system analyses the sihouettes of the performers’ hands and other objects as they move across the glass tops of the overhead projectors. The hand gestures are then analysed by our custom software. In response, our software generates synthetic graphics and sounds that are tightly coupled to the forms and movements of the performers’ actions. The synthetic responses are co-projected with the organic, analog shadows, resulting in an almost magical form of augmented-reality shadow play." The artist writes: "At Dean Clough's 'Sir Richard Young Gallery', on Saturday 29th January 2005, DA[N] presented 'Composition for OHP' by Rob Lycett. 'Composition for OHP' is an optical illusion machine. 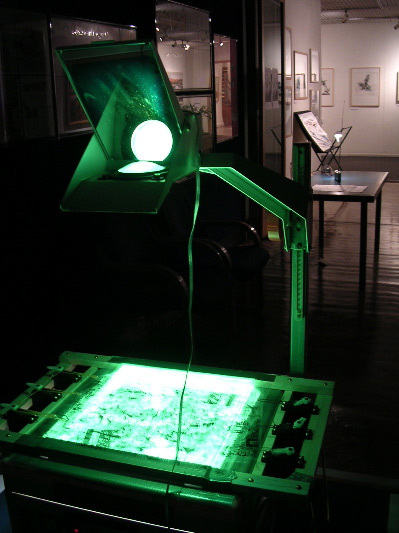 An autonomous robotic system, with ultrasonic sensors, controls the arrangement of acetates on an overhead projector. The multi-layered composition attempts to rationalise a three dimensional space, within the confines of a flat surface."